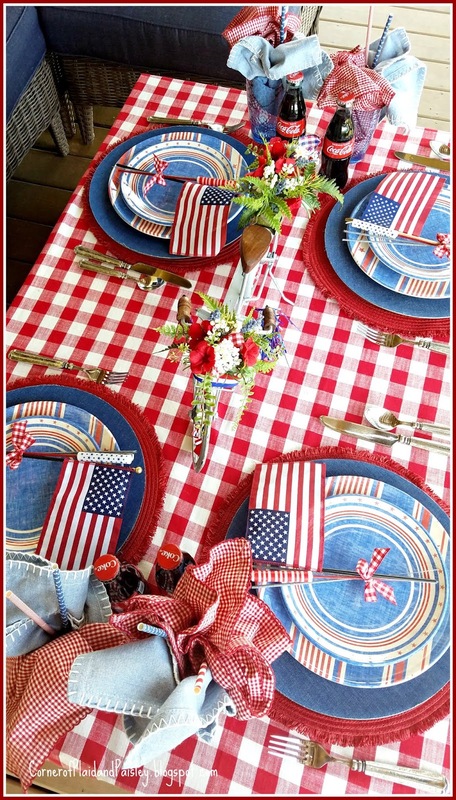 Red, White and Blue Tablescape Hop just in time for 4th of July! We are happily celebrating Independence Day with lots of Red, White and Blue! 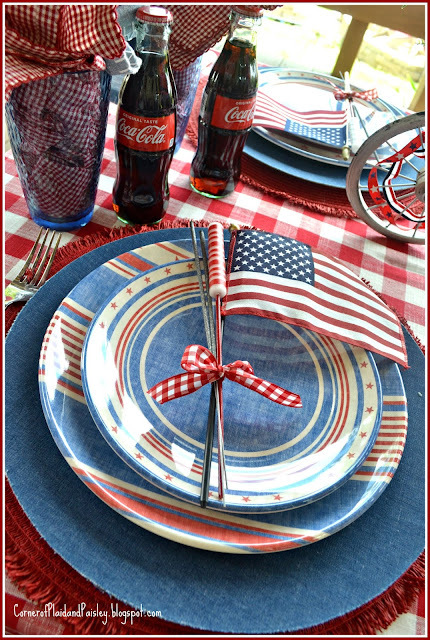 This is just one of the many patriotic tables you will see in our Red, White and Blue Tablescape Hop going on this week. 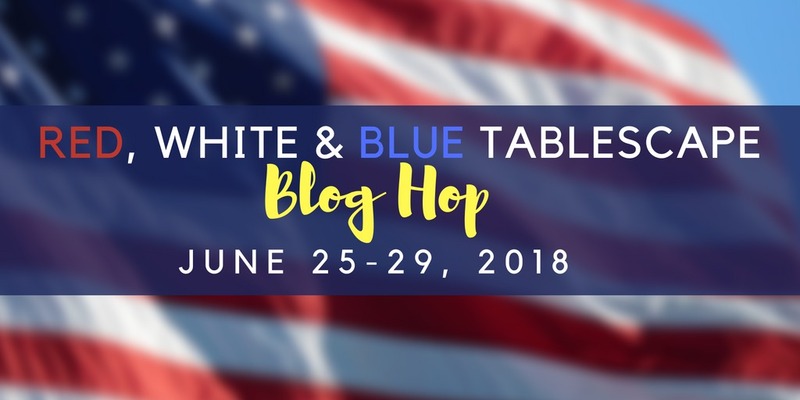 Chloe Crabtree, of Celebrate & Decorate organized a great group of bloggers who are eager to share their version of patriotic tables with you. All of the links to the other wonderful bloggers will be at the bottom of this post and updated as the week goes on. I chose to set my table up on my bottom deck, under the shade of the upper deck. The only thing I didn't think of is that since I was in the shade - the photo's were a bit trickier to take. There are lots of shadows in these photos, but I hope you can see them clear enough to get some ideas for your celebration. My table is actually a couple of crates with a board over the top, then covered with a picnic tablecloth. It is just the right height to enjoy a burger or hot dog as we enjoy some summer fun, while waiting for the fireworks to begin. I channeled my inner child when decorating this bicycle for my centerpiece! We used to decorate our bikes and join the parade when we were little kids. How many remember putting cards on your spokes with clothes pins to hear that motor like noise as you rode your bike?!? If you are really observant - you will see that I turned my bike around halfway through taking my photos!! You might, also, see our older dog, Brandy, making an appearance in a few photos - although it may be just a foot or a leg- she does not like to pose for photos - but when she finds a comfortable place to lay - I usually let her be because she is getting up there in years and she has a hard time getting up and down anymore. What is an Independence Day celebration with out a flag to wave and some sparklers for when it gets dark outside?! There is something about Coca-Cola that seems so Americana -I will be using my retro cooler to have some ice cold drinks ready to go when our guests arrive. Here is our younger dog, Lucy. She thinks she was the model for the pillow - but I am not going to tell her that I think it was a black lab - not the Golden Retriever/St. Bernard mix that she is! We will be having between 25 to 30 family members over to enjoy the spectacular fireworks show our little lake puts on. We also have a water ski show during the day - that is put on just to the left of our house - so we can view it well from both decks. I will have to set up some other eating areas, but this one will probably the favorite since it is in the shade. 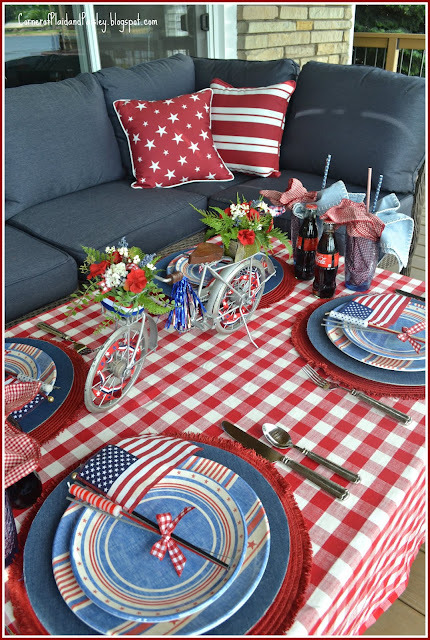 just click on the links to see more patriotic inspiration! Stay hydrated and be careful with the pyrotechnics! Patriotic Pillows - Joann Fabrics - 70% off! Ann, what a beautiful red, white, and blue table. I love the bike as your centerpiece. I do remember the card and clothespins on the spokes, sweet memories! Wishing you a beautiful Independence Day Celebration with your guests, the fireworks, and ski show! I love blog hopping with you! Ann, your porch is so festive. I am sure your guests will feel so special. I was charmed by your darling bicycle centerpiece! How sweet to remember your childhood decorating your bike. It is adorable. Your tablescape has all the elements of Americana and is very creative. 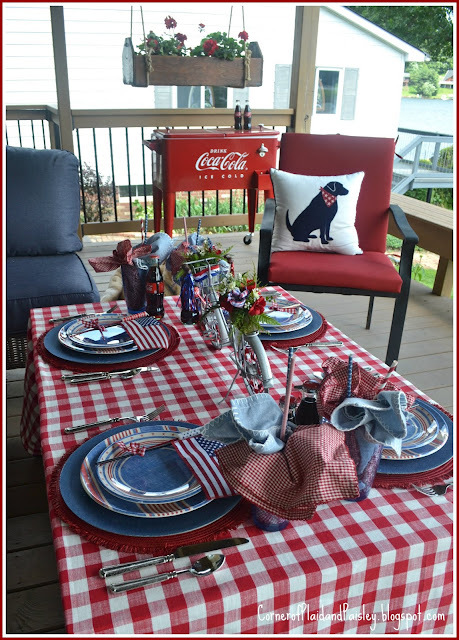 Enjoy your guests for your Fourth of July celebration. We have much to be thankful for in our nation. Your tables are always so creative, inviting and fun Ann! I am crazy about your bike centerpiece, adorable! Love the coke bottles and cooler, and you're so right, coke just makes one think of USA! Your 4th sounds like so much fun, we watch a fireworks display put on by a local resort which we can see by boat and also from our deck, ribs and fireworks have been our family tradition for over 30 years! Have a wonderful 4th!! Ann, I love everything about this beautiful and patriotic table! It is so cheerful and patriotic. Your photographs are perfect, and I love the bicycle centerpiece. It reminds me of when my children used to decorate their bikes for our neighborhood parade. I hope that you have a very Happy 4th of July!!! 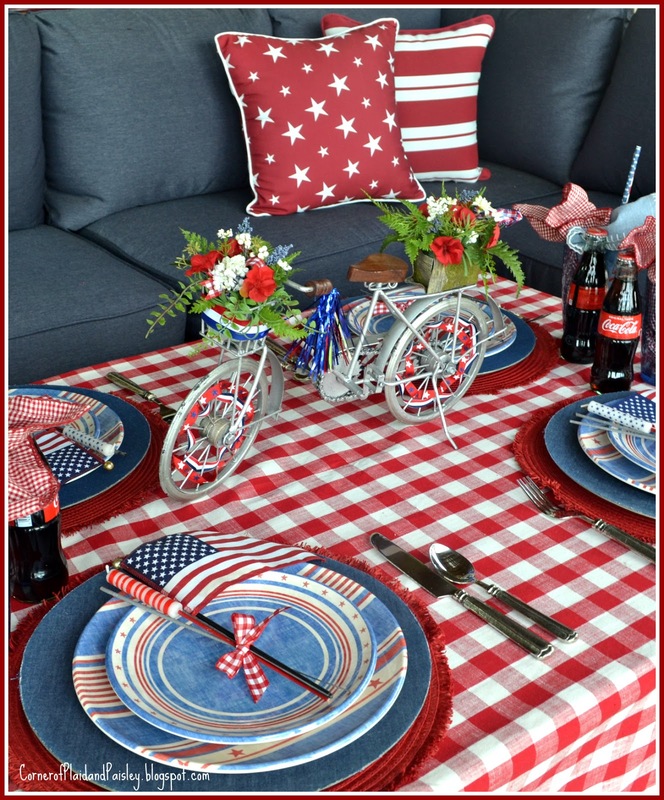 Oh my, you do the cutest job on styling your tables and I am with everyone else, the bicycle is so cute along with all of the Coca Cola accents, the classic bottles and the cooler on your porch! 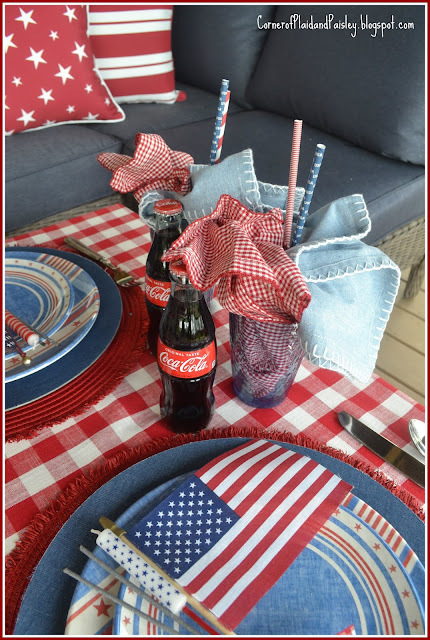 Of course, the addition of the sparklers and flags at each place setting are a sweet way for guests to celebrate the holiday! Thank you so much for joining us for another blog hop! Ann...I love your table...and I love your photo bombing dog. I have one that is aging a bit too and we need to make exceptions for them all the time. 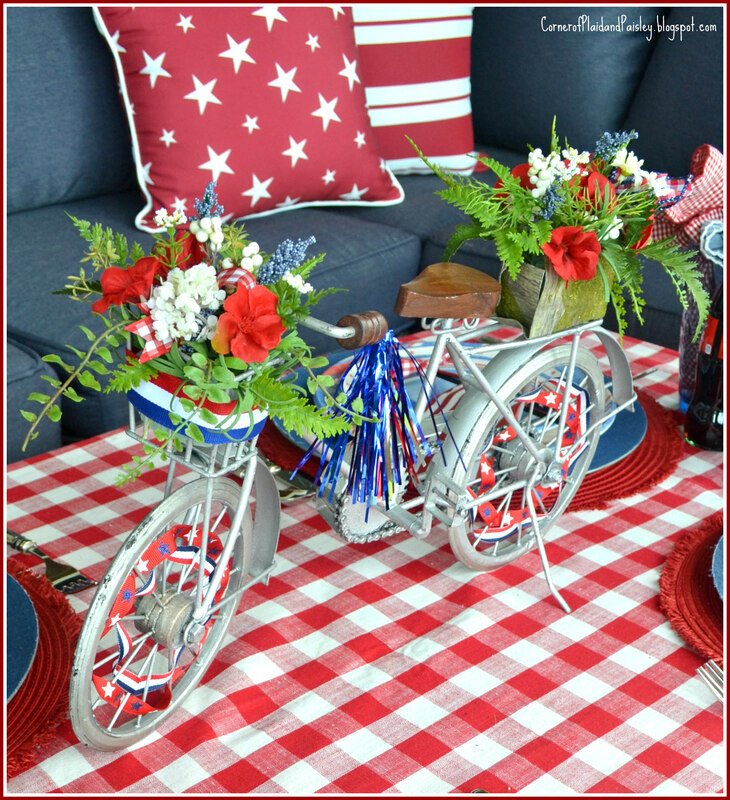 Your red, white and blue is so inviting and the bicycle is adorable. I used to put playing cards on the spokes of my bicycle for our annual small town parade. Thank goodness for all the older people in town and our parents or we would have had no spectators to cheer us on. Well this is just as wonderful, festive and patriotic as it can be! Love the details and oh goodness I am totally smitten with this darling bicycle. 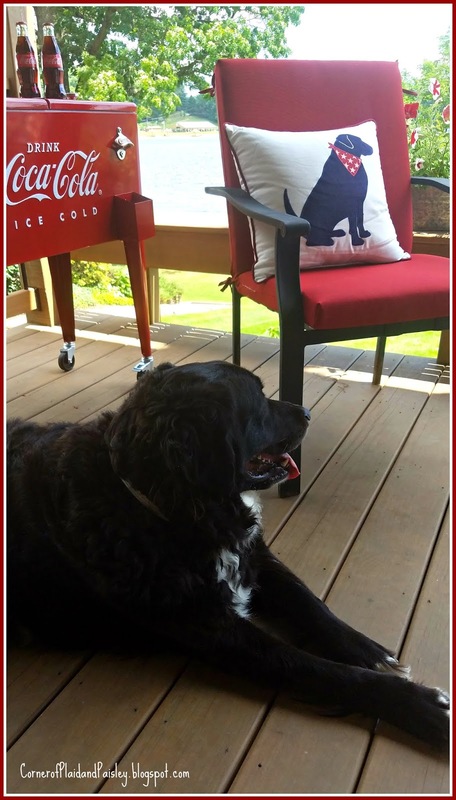 Love the classic coke and your front porch is perfect! 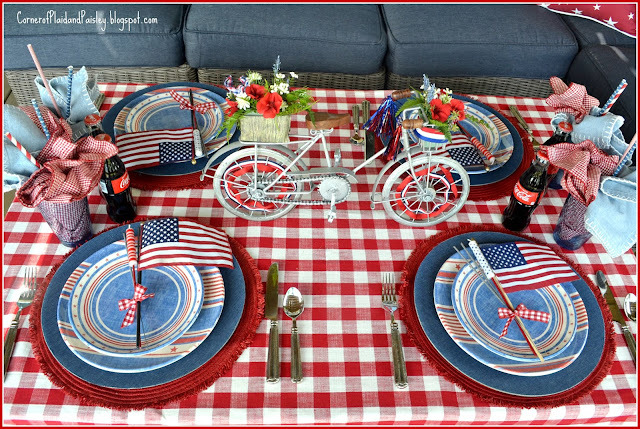 Ann, although I love the entirety of your patriotic tablescape, that bicycle centerpiece is so heartwarming and adorable! My Uncle Sam wreath features him on a bike too --- so, I have a soft spot there. I also liked that you set the porch coffee table, a unique and fun idea for enjoying the view. 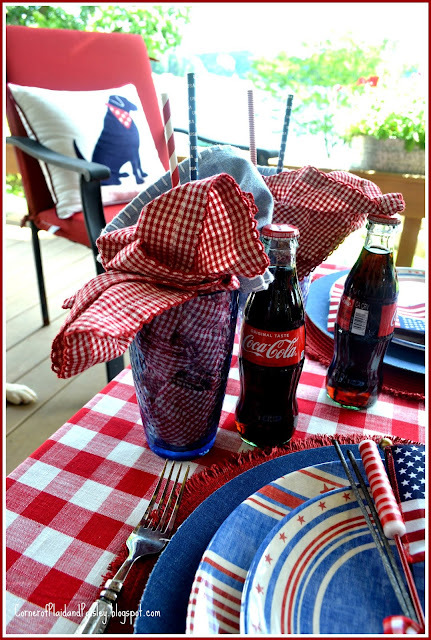 Ann, your patriotic table out on your porch sceams summer delight for me. I'm a patriotic girl at heart! Love that cute bike, your red and white buffalo check cloth, the darlig dish stack, well.... I jsut adore all your details. Happy 4th of July! What a perfect little slice of Americana... even down to the coca cola cooler! I'm so glad you let your old doggie participate, because his paw added charm to the photos! lol I'm a dog lover myself! You did a wonderful job. I'm a sucker for tinsel! and I love all the retro details. Looks great! when's the party? What a beautiful place to sit and enjoy the fireworks! The little bicycle on the table is adorable and I love the photo of your dog with the dog pillow-so cute. The coca cola cooler is calling my name! I love everything! Loved your table and especially the dishes. I could sit there, lean back, and enjoy the celebrations all day! Love your table especially the bicycle. Have you seen these plates?? What a great display on your lower deck, Ann. I think the photos turned out just fine. Love the little bike, and the shots of the pillow on the chair beyond with the tablescape in view. Happy 4th! You'll need a day of R&R after that large a crowd! Ann, I love the red tablecloth and the layered dishes. What a wonderful place to celebrate the 4th of July. Your table is perfect and brandy's photobombing is adorable! Happy 4th of July! 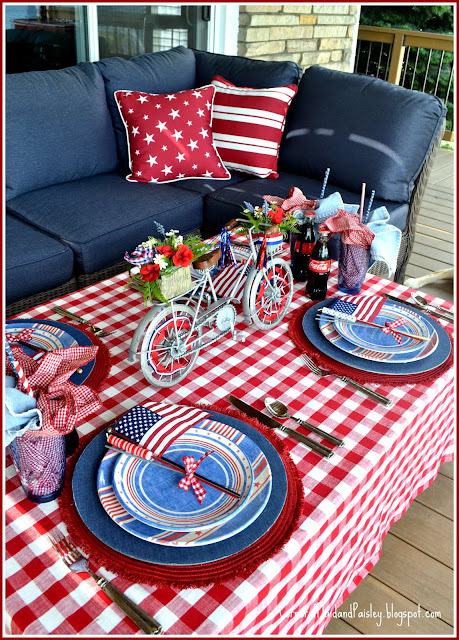 I think that this is probably one of the cutest and cleverest of all of the Fourth of July tables that I have seen this year. I love the little firecrackers on the plates, and you are killing me with that bicycle! So cute! Oh my gosh, so cute! That bicycle, all decked out in it's finery, is SO adorable. I love the sparklers and the check tablecloth. I can imagine that the 4th of July is a fun-filled event at your house! Great job!